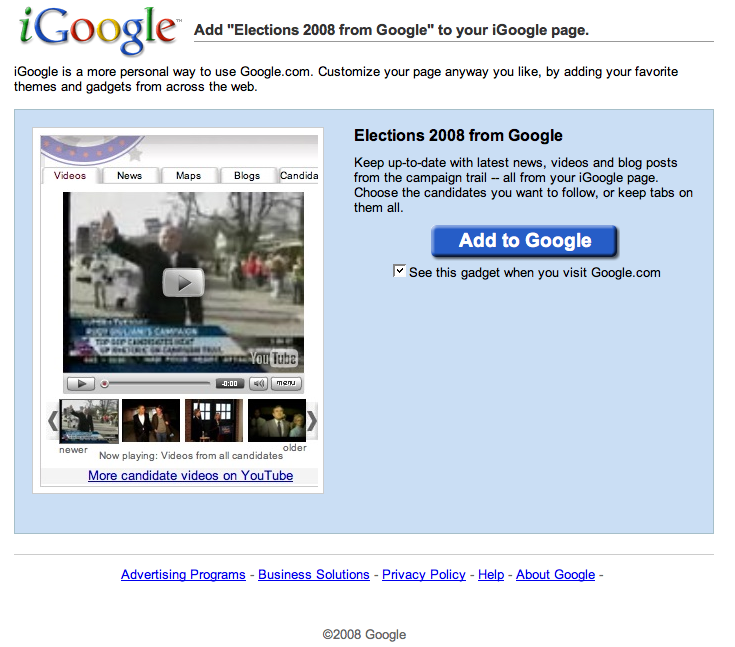 Google News has added a new gadget to track several forms of 2008 Presidential political media activity. 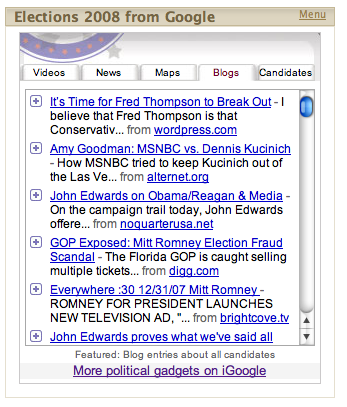 The gadget grabs political videos, news, maps and blogs of candidates from both parties. You can pick one or all of the past and present Presidential candidates you want to follow. I set this new Google political news gadget up under its own tab titled “2008 Presidential Race” in iGoogle to reduce its information footprint and reduce the overload that can occur when I try to digest the Google News home page. This entry was posted on January 17, 2008 at 11:01 pm and is filed under Barack Obama, Bill Richardson, Christopher Dodd, Dennis Kucinich, Duncan Hunter, Fred Thompson, Google News, Hillary Clinton, iGoogle, Information Footprint, Joe Biden, John Edwards, John McCain, Mike Gravel, Mike Huckabee, Mitt Romney, Political Gadgets, Political News, Ron Paul, Rudolph Giuliani, Tom Tancredo. You can follow any responses to this entry through the RSS 2.0 feed. You can leave a response, or trackback from your own site.